When your cruise ship docks at the Port of Dubai, head out to discover the Dubai desert with a private driver/guide! The exciting 5-hour shore excursion includes transport by 4x4 vehicle, a camel ride, sandboarding session and a visit to a desert campsite. Get a henna tattoo if you wish, and then feast on barbeque dinner while watching two shows: a tanoura folk dance plus a belly-dancing display. Meet your guide outside the cruise terminal in the Port of Dubai, and then travel toward the Dubai desert in your air-conditioned 4WD vehicle. Relax as your private driver/guide chats about Dubai and its surroundings, and take in views of the desert scenery that abounds. Your first stop is a traditional camel farm to learn how these magnificent creatures are able to survive in the harsh desert landscape. Back in your 4x4, continue traveling across the Dubai desert and travel to the campsite. 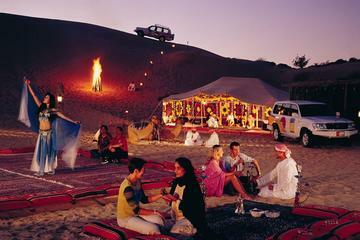 Once you reach the desert campsite, hop on board a camel for a short ride across the desert. Next get ready for your adrenaline-rushing experience: sandboarding! Show off your balancing skills while mastering the art of surfing on sand, and race other people in your group down the dunes. Relax in the campsite as dusk falls, and then start your evenings entertainment! Get a henna tattoo on your hands or feet, if you wish, and then watch a traditional folk dance performance called tanoura. Feast on a delicious barbecue dinner with soft drinks as the sun sets over the Dubai desert, and then enjoy your evenings grand finale  a live belly-dancing performance around the campfire. Sit back and enjoy the show while smoking a shisha (Arabic water pipe), if you wish, and then travel back to the Port of Dubai. We will ensure your timely return to the Port of Dubai for this activity. In the rare event your ship has departed, we will arrange for transportation to the next port-of call. If your ship is delayed and you are unable to attend this activity, your money will be refunded. See our terms and conditions for full details.